Then Vern backed the truck up as much as he could. With muscle power, the people in the front were lifting her, and the people in back were pushing. 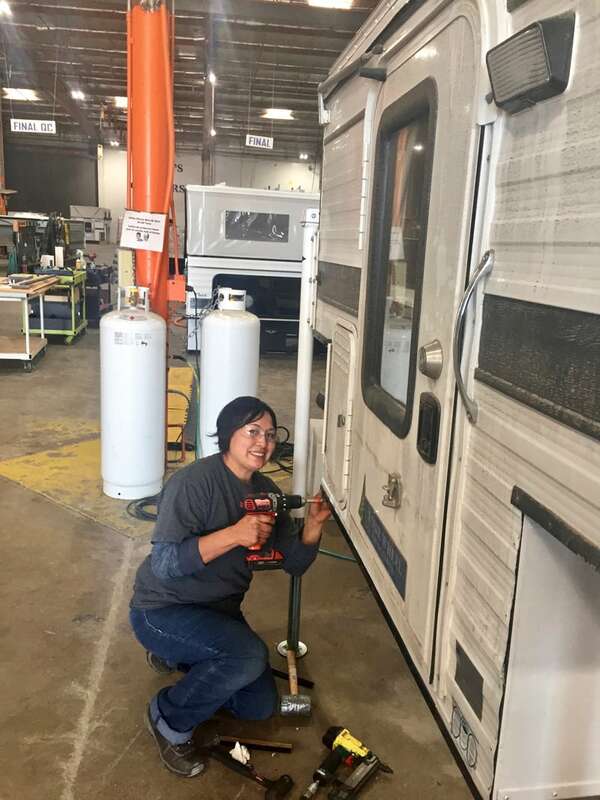 We managed to get the lip of the main body of the camper to the flat part of the truck. Once we did that we could all lift and push, and in she went. In 15 to 20-minutes she was back on truck. After the camper was on, they bent back the turnbuckle hook that bent. They reattached the turnbuckles, tightened them up, and put a strap around the back to make sure they wouldn’t fall off. The team was equipped with a compressor and re-inflated the tires. I was lucky that they had the right tools on hand. They just took over and patted me on the back. It was a fun challenge for all of us. It all turned to happiness and joy in a short time. 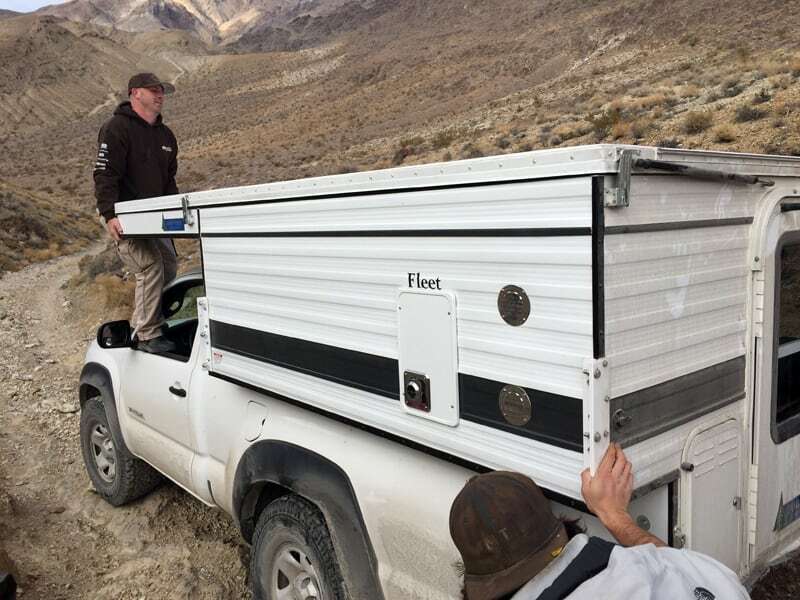 It took less than two-hours from the camper falling off to driving back down the mountain. California is a huge place. I was on a tiny little trail and ran into these guys. What are odds? After the camper was put back on we had the best fun. A lot of the guys were my age, so we were swapping stories. They said, “Let’s have lunch”. They had brought lots of sandwiches and drinks. We hung around their trucks laughing. I can’t believe I got a free lunch! These guys were on a schedule. They were up here to do work, not just to have fun. I am so grateful that they dropped everything and came to help me out. It was a sacrifice for them. The weather came in, and the light changed for their photography. I’m not sure they got to do what they needed to do. I can’t thank them enough. After lunch they said, “Neil you go down the hill first and we’ll follow you to make sure you make it to the tarmac again”. I slowly drove down the trail and made it to the bottom. Then I went to each one of them and thanked them personally for what they did for me. I have received lots of emails from them since. From there I headed back to Lone Pine. 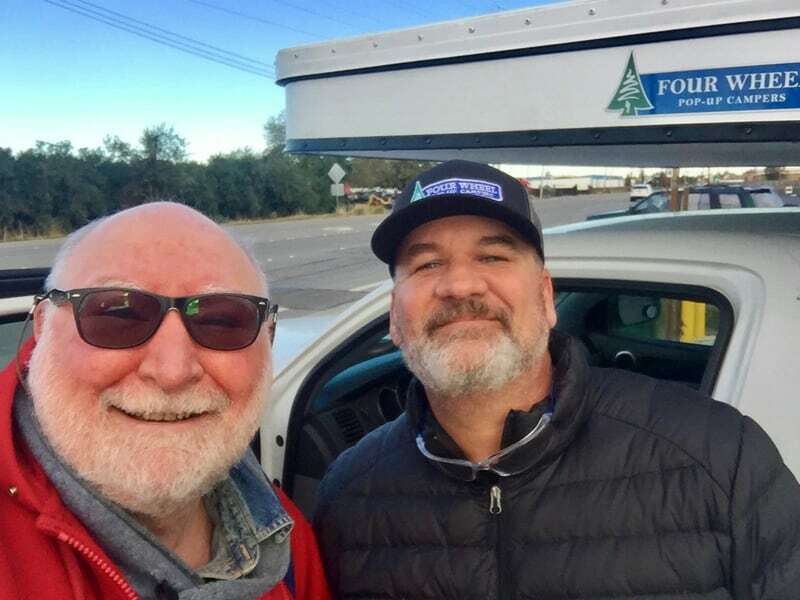 My next objective was getting the camper back to the Four Wheel Campers factory in Woodland, California. It was a bit weird with the air bags aired down, but the truck was okay. I stayed the night in a hotel in Bishop. I was pretty exhausted and emotionally weakened. The first thing in the morning I called Four Wheel Campers and explained what happened. I was headed back to San Francisco, passing by Woodland and asked if there was anything they could do to repair my camper. I told them that I thought it was just cosmetic damage. They said to bring it straight in. 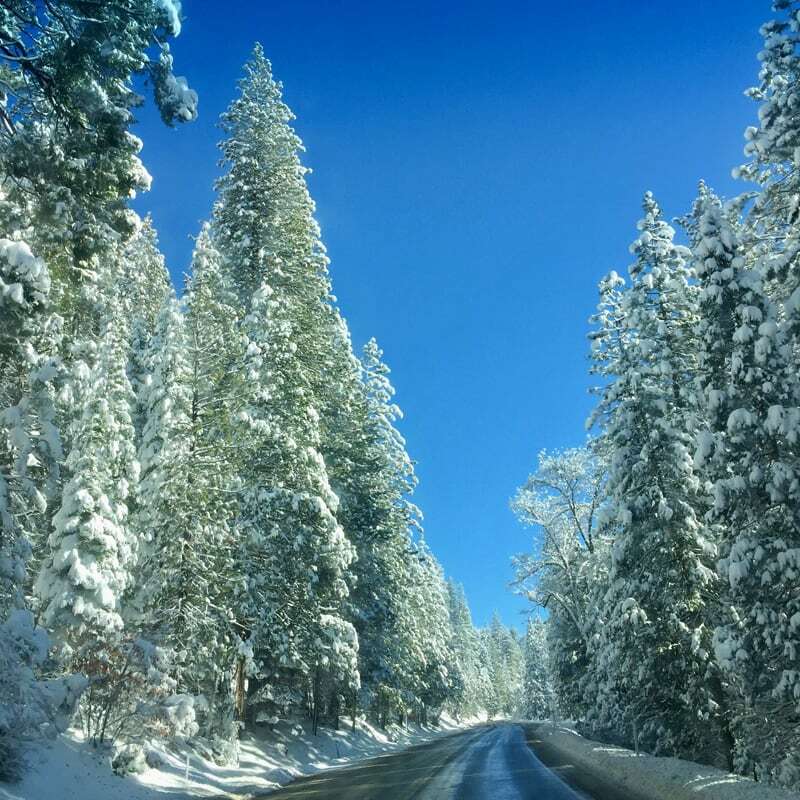 I had an epic drive because there was a lot of snow on Highways 395 and 50 across the Sierras. I was driving at 35 miles per hour. I live in Okinawa, which is an island south of mainland Japan. I don’t ever see snow. That day I saw beautiful snow forests and expanses of snow covered desert. I got to Four Wheel Campers around 7:00pm. Stan Kennedy waited at the factory to make sure I got in okay. He showed me where I could park. By Stan staying it was clear that Four Wheel Campers was going to take good care of me. 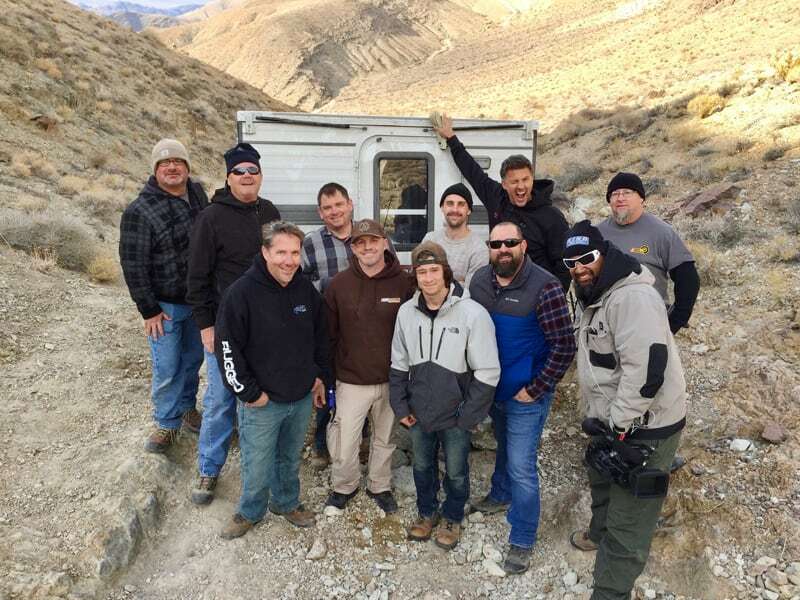 The next morning Aaron Geiger and his team took the camper immediately. Through their inspection they found that the back bottom trim had been dented in. That was more from us pushing the camper on ground to lift it on the truck. That damage was repaired. They also put lock nuts on my turnbuckles. In theory, the turnbuckles won’t come loose again. They also put a chain from the camper to the securing point in the Tacoma. There are now two chains that are only 3 to 4-inches at most. The lock nuts will make the procedure of tightening the turnbuckles harder because I will need a wrench to do it rather than hand tightening. For most people in most situations, hand-tightened turnbuckles (my original set-up) works fine. The accident was my fault. I should have been more diligent about tightening the turnbuckles given the off-road conditions I was traveling.